The vacation rental industry is being taken over by large listing sites and corporations. These companies want to control your business. They’re digging deep in your pockets with padded commissions, booking charges, and processing fees. They won’t let you run your business under your terms anymore! They want to control your communication with guests. They hide your listings from travelers if you don’t follow their rules. Their approach has been highly aggressive. They’re continuing to tighten the grips on our small businesses. We need to protect our investments and do something about it! Never before have we experienced such a disruptive environment in the VR marketplace. And if the past is an indicator of the future, there’s more trouble ahead for us. We’re in a state of emergency and I’m sounding the alarm. I hope owners and managers adhere to the warnings before the changes take their toll. It’s time to break the glass, this is an emergency! In The Breakaway Kit, I’ve listed the most critical tools you’ll need to develop bookings on your own. These are marketing tools that you’ll own and or control. They’re listed in order of how they’re used in a vacation rental marketing plan. As you read about each tool, it will become clear how they all work together. The power-tools I’m pulling out today are ones I use myself. This resource is for those who need help breaking away! These are the essential tools needed to develop your vacation rental independence. The best part of what I’m sharing is, many of these tools are free or reasonably priced. But yet they’re invaluable to your business. Especially when you consider the power and insight they give you. 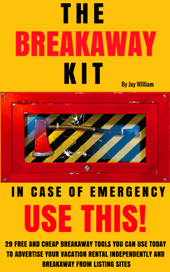 I’ve listed 29 resources in The Breakaway Kit. I’ve spent a good amount of time preparing this for you and others like you. Why? This cause is important to me and I know there are many who need help right now!